Adrian Peterson, who was named to the Pro Bowl earlier this weekend, has 1,266 rushing yards and 10 touchdowns this season, on 279 attempts. 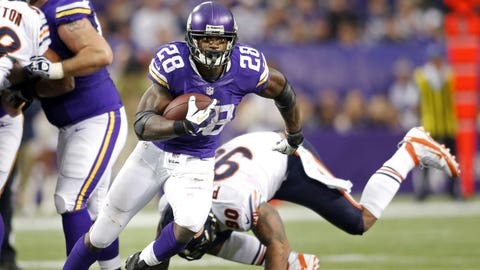 MINNEAPOLIS — The Minnesota Vikings have ruled star running back Adrian Peterson out for Sunday’s season finale against Detroit at the Metrodome. Peterson has been dealing with a lingering strained groin and sprained right foot in recent weeks. The Vikings sat Peterson out for the second half of their 42-14 loss at Cincinnati last Sunday. The Vikings star said Thursday his strained groin was bothering him more in recent days than his right foot ailment. Minnesota will play its last game in the Metrodome on Sunday. Peterson had rushed for more yards in that venue than any other player. Peterson, who was named to the Pro Bowl on Friday night, has 1,266 rushing yards and 10 touchdowns this season on 279 carries. Last year, of course, Peterson produced 2,097 rushing yards en route to earning NFL MVP accolades. The Vikings will also be without backup running back Toby Gerhart against Detroit, due to a strained hamstring. That means reserve Matt Asiata should get extended action against the Lions.